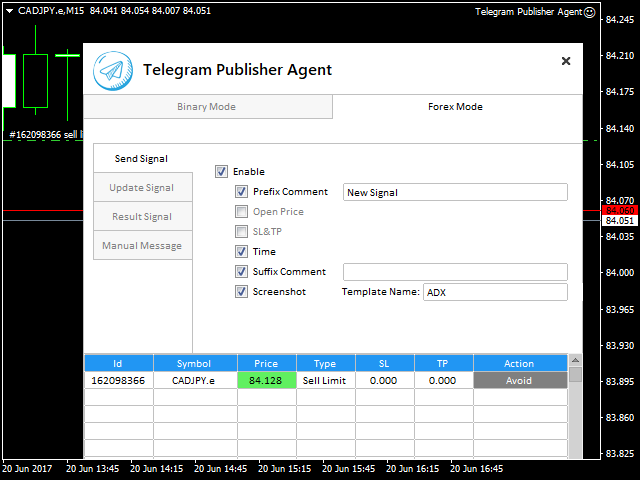 The Telegram Publisher Agent was designed to Publish all your trades as signals in your channel and group. 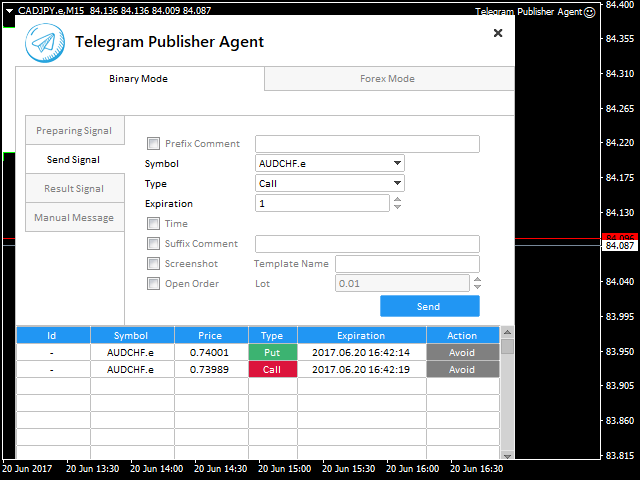 All you have to do is provide the trades, the Telegram Publisher Agent will then do all the heavy lifting for you getting your trade signals out to your trading channels or groups with just a click of a button. The Telegram Publisher Agent accommodates 2 separate trading styles: Binary Options,Forex Trading. Prefix Comment: For example, “Waiting for a Trade.”. Symbol: Here you select the currency pair to be traded. Type: This is where you select Call or Put for Binary trades or Buy Sell or a pending trade for Forex trading. Price: Here you can decide if you want to include the price in the message. Time: This is the Server time of the trade to be taken. Suffix Comment: Allows you to add any additional messages that you may deem necessary. Screenshot: This option allows you to stipulate which Template to take a Screenshot of and include in the message or just leave it empty to send a Screenshot of the Default template. 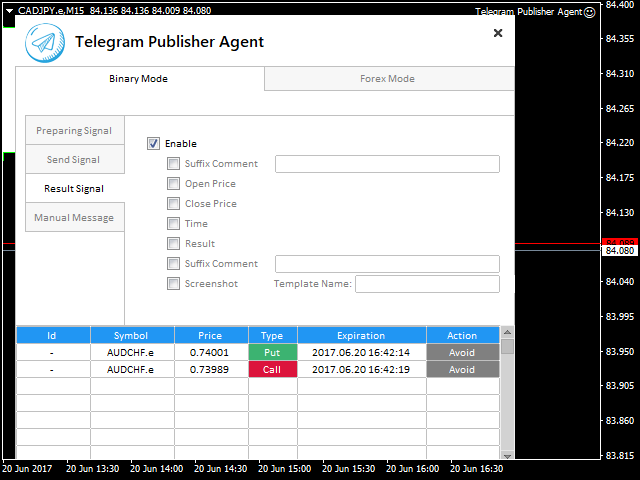 Send Signal: This is where you send the signal with all the parameters that you have selected to be sent. Expiration: Here you select how long you want the trade to be active. Open Order: When checked an open order will also be placed when the Send Signal is sent. When the Send Signal is sent you will see an “Avoid” button besides each trade giving you the option to avoid any sent trades. Result Signal: As soon as the signal expiry or hit take profit / stop loss level or close, the Result Signal has options where you can select what result information to send and any messages that you wish to include. Group Id - add all your groups id by separate symbol ";". E.g: "12345;234323;1212122;". Channel name - add all your channel names by separate symbol ";". E.g: "channel1;channel2;channel3". Magic Number For the orders - enter your Ea Magic here Or Set it to 0 if you want manage manual trade. if you want all orders on terminal set it to -1 . The table at the bottom shows all the signals that you have send it. 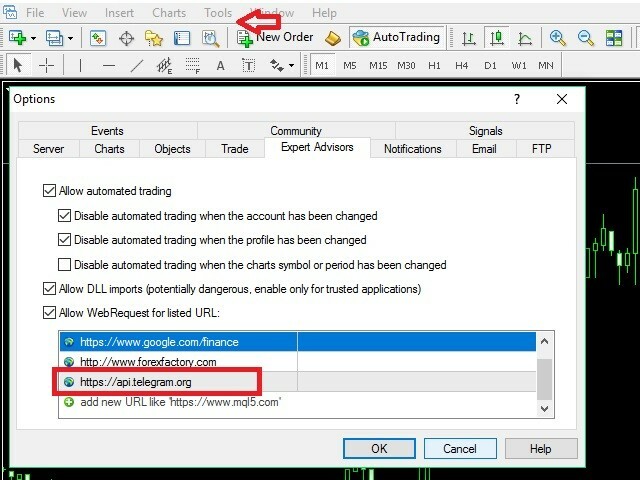 You must add the URL “https://api.telegram.org” to Tools > Options > Expert Advisors > Allow Web Request for listed URL in order to load news data from the source. 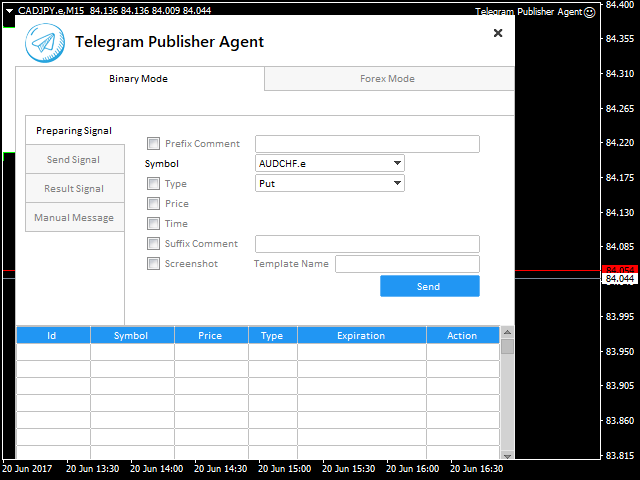 In your Telegram Channel or Group click on add admin search for @MetaTrader_Publisher_Agent_bot and add it as member and admin. go to https://web.telegram.org to get your private group or channel id. 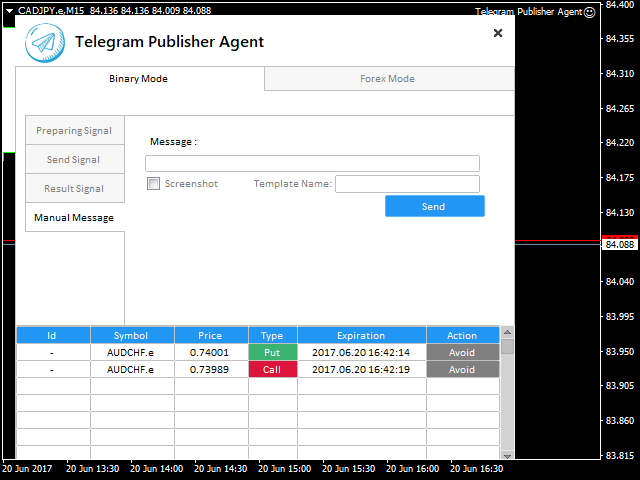 Please feel free to give your opinion about the Telegram Publisher Agent, thoughts and ideas for alterations, additions and improvement are most welcome. Stay tuned for future improvements due to be added soon. - Now the Tool can follow any expert. Just put your expert's magic number in the inputs, and the tool will send the signal based on this value. You can set the magic number to (-1) to follow all trades in the terminal.